Hello friends! Madhya Pradesh has so many places of historical importance. And from different eras. It is a difficult task to choose the best one among these places. However, one place that stands out and has something for everyone, it is Chanderi. 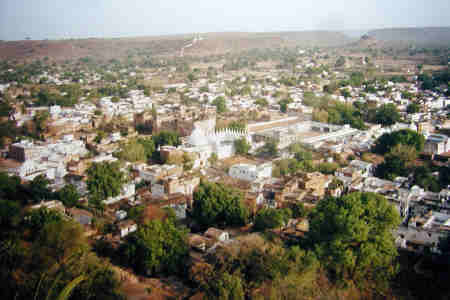 Chanderi is a beautiful scenic town in Madhya Pradesh. From lakes to hills to forts to forests, you name it and you have it here. The exotic locations of the place will leave you spellbound. The historical forts of Chanderi showcase the richness of culture, art and architecture during various periods. 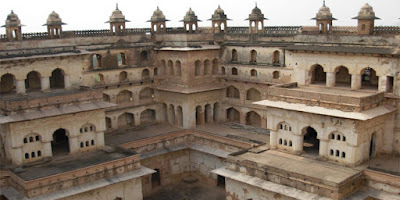 Many historical monuments built by Bundela Rajputs and Malwa Sultans can be seen here. The history of Chanderi goes back to 11th century. Persian scholar Alberuni mentioned about this place in the year 1030. It was ruled by Sultans in the earlier years and later by Rajputs. Different religions have flourished here in the years gone by. It has a regal radiance to it and while visiting the place and it's monuments, you may get a feeling of royalty. The monuments, built in different times, provide a glimpse of the art and architecture prevalent during different periods of history, here. There are at least 375 monuments here. As many as 1200 Baolis(step wells) were built here, which are a major attraction of Chanderi. 1. Chanderi Fort - This is the most beautiful and famous monument of Chanderi. Situated at a height of 71 m on a hill, you can get a very good view of the town from here. Chanderi fort was built in 11th century by King Kirti Pal. However, it was rebuilt many times due to repeated attacks. 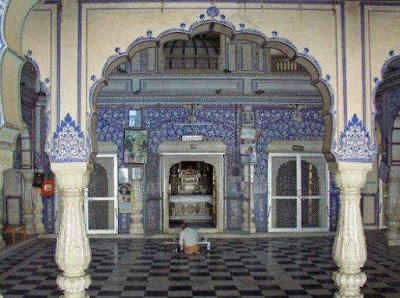 It is built in Mughal architectural style and has three doors to enter it. The best known is the first door called Khooni Darwaza or Blood door. It is called so because it is said that criminals were thrown from this door and crushed. Third gate is the tallest gate and is known as Hawa Paur. The third gate is most weirdly named as Khatti ghatti. It is located on the south western part of the fort. Two of the major parts of Chenderi fort are Hawa Mahal and Nau Khanda Mahal. It lies to the southwest of Betwa river. 2. Koshak Mahal - If you are in Chanderi, you can't miss this one. Koshak Mahal is the most important palace of Chanderi. Built in 15th century, it is said to be the brainchild of Mahmud Khilji. He intended to build a seven storey structure but only two storeys could be built during his lifetime. Koshak Mahal is devided into four equal parts with each part connected to other and yet remaining separate. All the four mansions of Koshak Mahal are identical, built entirely from local white sandstone. The grandeur of the palace gives a very imposing look. The sheer vastness of the structure will leave you mesmerized. 3. Chanderi Museum - Opened formally in the year 2007, this museum has a lot to offer in terms of collections from history. Museum has been divided into five galleries. 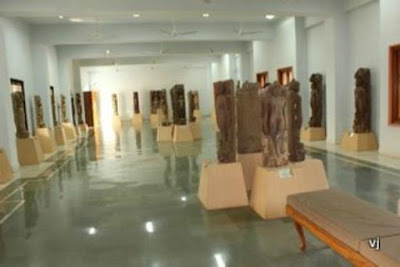 They are History of Chanderi, Anandam, Jain gallery, Shiva gallery and Digpal gallery. The collections in the museum are mainly from art and architecture and date back to 10th to 12th century. The architecture and sculpture of Jain site of Budhi Chanderi have been prominently displayed here. 4. Shri Chaubisi Jain Temple - This is an ancients and a very huge Jain temple. It has big idols of all the 24 Jain Tirthankars. The idols are basically rock sculptures. The beauty of idols is that they have been built by the same color rocks as the color of Tirthankars was. This is the only temple in India with such idols. Another unique feature is that all idols have same dimension, which speaks volumes about the sculpture's expertise as it is extremely difficult in the case of idols made from rocks. 5. Shahzadi ka Rauza - This is a 15th century memorial, believed to have been built in the memory of a princess and her lover who was a common man. It is said that the princess and her lover are buried here. It is a square building and has two levels with each level supported by beautifully carved brackets which are serpentine in contour. Outside of the monument has traces of glazed tiles. Inside there are two graves exquisitely carved. There were probably four chatris earlier but now only one remains. But still the monument remains as pretty as ever. Apart from the above, there are many more big and small historical monuments in Chanderi which will leave you spellbound. And once you are done with the history, head straight to checkout world famous Chanderi sarees and fabric. Built from handlooms, these are lightweight and fine but still look regal and opulent. These sarees and fabrik are made from both cotton as well as silk. So shop to your heart's content. Chanderi is situated in Ashoknagar district of Madhya Pradesh. 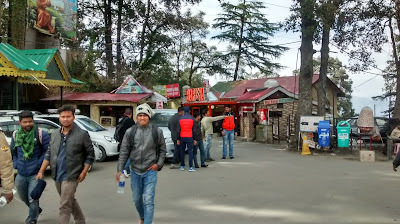 It is located at 37 km(23 mi) from Lalitpur and 128 km (80 mi) from Shivpuri. Air - Nearest airports are Bhopal and Gwalior. Bhopal is 220 km (140 mi) away and Gwalior is 250 km (158 mi) away. Taxis are easily available to reach Chanderi. Rail - Lalitpur and Shivpuri are two nearest major railway stations. From these stations, you can hire taxi or state run buses are also available to reach Chanderi. Road - Chanderi is very well connected to all the major towns of Madhya Pradesh by road. State run buses and private taxis are available to reach Chanderi. 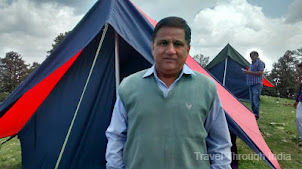 Hotels are available in Chanderi to suit all budgets. You can take your pick. So with weather getting better, it's time to checkout some of the most beautiful and memorable monuments of Chanderi.